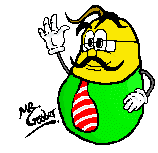 Mr. Goober's Gabbles: New Blog Again?! so this blog will be long and hard? lol :P i knew it sounded bad, so i added 'it's adhesive'! Long and hard huh? I have one post ready for you - you've been tagged!